"Hey Joe, how would you compare a home in Ox Bottom Manor to a home in Summerbrooke?" I just love reader questions, and this is one that we often receive from buyers who have targeted the $300,000 to $500,000 price range on the NE side of the Tallahassee real estate market. As you will see from this analysis, these two adjacent neighborhoods produce a lot of home sales in this price range each year, thus they are often compared and contrasted with each other. Before we continue further in the analysis, do you have an opinion on which neighborhood might have the more expensive homes? As far as location goes, you would think that adjacent communities, sharing the same school zones and access to town would not differ much. And you might think that with Summerbrooke being built around a golf course that it's home prices would be higher. But take a look at the tale of the tape ... and you will discover what buyers have determined when comparing Ox Bottom Manor homes to those in Summerbrooke. The first real estate graph in our report compares the average annual home sales price in Ox Bottom Manor (blue line) with the average annual home sales price in Summerbrooke (Orange line). On average, home prices in Summerbrooke have been about 8% higher on average ($23,000) than homes in Ox Bottom Manor. 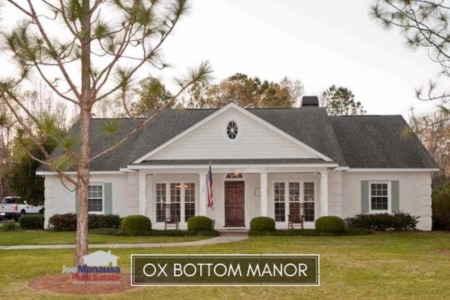 There have been years when the differences have grown or shrunk, but overall we can say that buyers have spent more money to live in Summerbrooke than they have to live in Ox Bottom Manor. The next graph compares the average annual home sales value in Ox Bottom Manor (blue line) with the average annual home sales value in Summerbrooke (Orange line). For the purpose of this comparison, value is measured in price per square foot of heated and cooled space of a home. This is where our analysis gets interesting. The first graph showed the amount of money that buyers were spending, but this graph shows what they were getting for their money. As you can tell, the values are very closely matched. Over the past 24 years, home values have been $1.39 per square foot cheaper in Summerbrooke than they have been in Ox Bottom Manor (about a 2% difference). The next and final graph in our report explains why. The final graph compares the average size of homes sold each year in Ox Bottom Manor (blue line) with the average size of homes sold each year in Summerbrooke (Orange line). For the purpose of this comparison, home size is measured in square feet of heated and cooled space of a home. As you can clearly see, Summerbrooke homes are larger than their counterparts in Ox Bottom Manor. 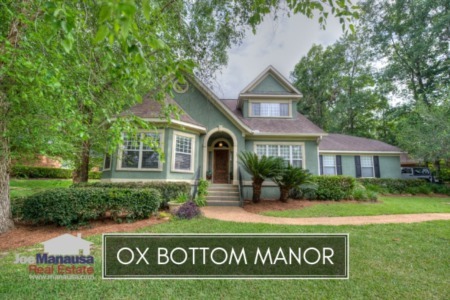 For the past 24 years, homes sold in Summerbrooke have been about 12% larger than those sold in Ox Bottom Manor (313 square feet different). It is very typical to see larger (similar) homes selling for a lower price per square foot than smaller (similar) homes. Why? Because a lot of the cost of a home falls in the kitchen and master baths of a home. Since the homes in Ox Bottom Manor and those in Summerbrooke are very similar, these common costs are divided by more square footage in Summerbrooke than they are in Ox Bottom Manor, meaning a lower price per square foot. But land costs are also divided in these price per square foot analysis, and one might think that having a golf course in the community would have made home values in Summerbrooke higher than those in Ox Bottom Manor. Apparently not. I believe 24 years worth of sale history is showing us the prices and values for homes in these two neighborhoods are very similar, it is just larger homes selling for more money than smaller homes. So take a look at homes for sale in both neighborhoods when you are ready to make a move, and remember, there really is not a calculable difference in values that exists beyond the size and condition of the homes, so a great value in either neighborhood will really stand out. I hope our analysis helps you when you want to compare a home in Ox Bottom Manor to a home in Summerbrooke, and please do not hesitate to contact us if you would like a more specific comparison between homes.